Giant Teddy Bear Is Ultra-Soft, Making It Super Conformable for Hugging and Cuddling. The Huge 11 Ft, 133″ Teddy Bear Is Designed with A Zipper on the Back, Making It Easy to Wash.
WOWMAX Teddy Bear is Stuffed in New Jersey, USA Using PP-Cotton – Safe for All Ages. 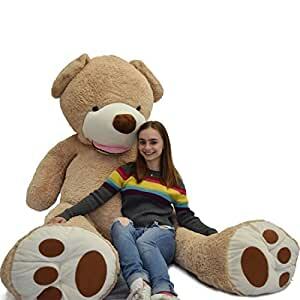 This Big Teddy Bear Is Compressed into A Package Smaller Than Its Actual Size And Arrives in 2-3 Days So That It Quickly Expands to 11 Ft Tall Once The Packing Bag Is Removed. In Comparison, 10-15 Days Shipment Causes the Teddy Bear to Permanently Morph and Lose Its Original Shape. Unique body-pillow inspired shape makes him a great pillow, backrest and comforting companion to cuddle. All of WOWMAX brand teddy bears are stuffed in New Jersey, USA. We will process your order as soon as we get it, generally, you can get it much earlier than you think.